Hello Lover!!! The Ulitmate Kelly Bag By Hermes. Designed by Pierre Hardy. So many of us have dreamed of owning or even longed to pre-order a Kelly bag from Hermes. Designer Pierre Hardy has taken the ‘IT’ bag to a new level by creating this masterpiece which will be forever known as the ‘Iconic Accessory’. It is the ultimate statement of luxury made of rose gold with diamonds that function as both a handbag and bracelet. Bracelet? Yes, the beautifully crafted stone-studded handle acts as a cuff when detached. To bring the item back to its ‘IT‘ bag status a detachable shoulder strap is not far way to make this desirable multifunction statement piece even more unique. Be mindful that this piece is quite small with immense jewels. In the words from the designer himself, Hardy says, “I wanted to distill all the value of the leather bag into something small and precious, like the essence of a perfume”. Which he has done successfully. The process to make such a piece involves 1,200 hours of labor, 1,600 diamonds weighing 33.94 carats, with a casting technique which is so complex that each piece of rose gold is individually shaped and polished to create the crocodile like effect. 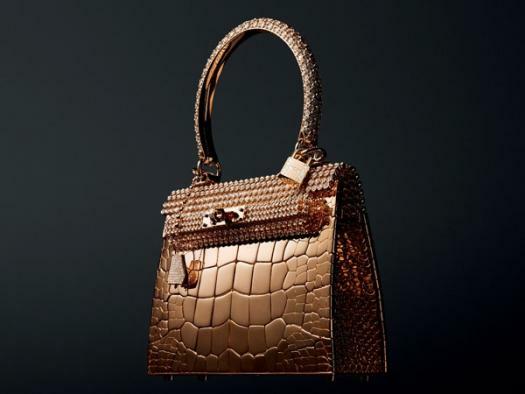 Only 4 bags have been made to date, and to buy one it will set you back a cool $1.9 Million Dollars. This is accessory art at it’s finest.